Saul Williams (born February 29, 1972) is a hip-hop artist, poet, writer and actor who has collaborated with Trent Reznor and Nine Inch Nails on several occasions. 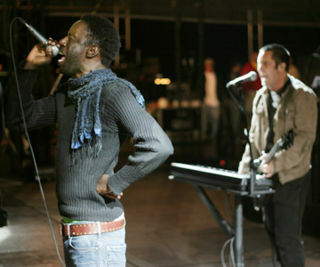 Besides opening numerous shows for the band on the Live: With Teeth tour, Williams was joined by the full NIN touring band during the Voodoo Festival in New Orleans to play "African Student Movement" and "List Of Demands" from his self-titled album. Bootlegs of this performance are widely available. Reznor produced Williams' third full-length studio album, The Inevitable Rise And Liberation Of NiggyTardust!, which was made available for download on November 1, 2007. In addition, Williams has contributed two tracks to Nine Inch Nails' Y34RZ3R0R3M1X3D: "Gunshots By Computer" and "Survivalism_Tardusted" which was previously included on the Survivalism single. There is however some speculation that this mix was actually written by Thavius Beck and Williams just performed the vocals. Order and download The Inevitable Rise And Liberation Of NiggyTardust! This page was last modified on 27 October 2016, at 16:00. This page has been accessed 42,384 times.